People can spend more time on bathroom for taking a bath and getting freshness after working all the whole day. Small bathroom can also become comfortable room by using visual effect and decorative element. 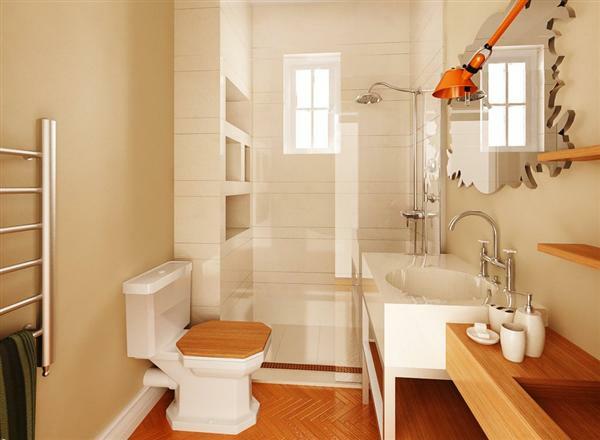 Key factors to solve problem of small bathroom is making it felt larger, bright and look clean every time. With a little treatment, it will get significant difference to create cozy bathroom. Small space bathroom design is planned by considering material and color selection, also use wall, ceiling, lighting and decorative ornament to get comfortable bathroom. First important thing to get good small space bathroom design is using glass and mirror. Window with white blurry glass is perfect material for entering natural light to brightening bathroom and in the same time covering bathroom from outside. Also installing big mirror will maximize light function to brightening this bathroom. Big mirror on the wall make this bathroom seem become double and larger. Second essential thing to create best small space bathroom design is selective on colors selection. On small space like this, function of colors will play serious role. It can provide larger impression. Paint all of wall in the same light color make this bathroom look bigger. White and neutral colors are good as reference. Third crucial thing is ceiling. Don’t ever ignoring ceiling. Ceiling can be seen as wall on top side of room. It will be given special treatment to reach better result. White wall make this ceiling seems higher. If we will add decorative element, simple molding can be added. Avoid molding with complex shape and style. It will give clutter effect on this bathroom. Fourth thing is installing shelving. Shelving on bathroom is different function with shelving on living room. Functionality aspect to store any items get attention more than on living room. On living room, shelving is used to display many interesting items. Aesthetic aspect is more dominant on living room. Good effort to paint it in the same paint color with wall. It will make this shelving seems disappear. Fifth thing is lighting. Lighting presence will bring significant difference. 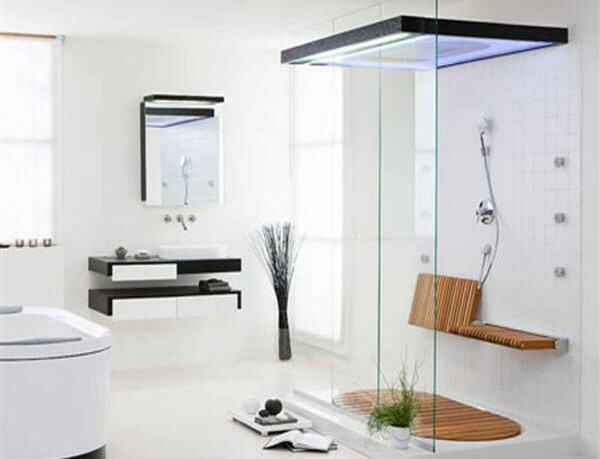 Bright lamps to brightening all of bathroom space will reduce narrow impression. Sixth thing is creating wall decoration. Vertical strip line ornament can make this bathroom ceiling look higher. Wallpaper and faux painting kits can do it. Make sure this bathroom wall is not humid if we like wallpaper, because it will cause growth of mildew. Need more great design ideas on 6 Solutions For Small Space Bathroom? See our full gallery!